It's almost the end of 2012 and today is an especially COLD December winter day. I guess Mother Nature has decided to ring in the New Year with frigid temperatures and super strong wind! 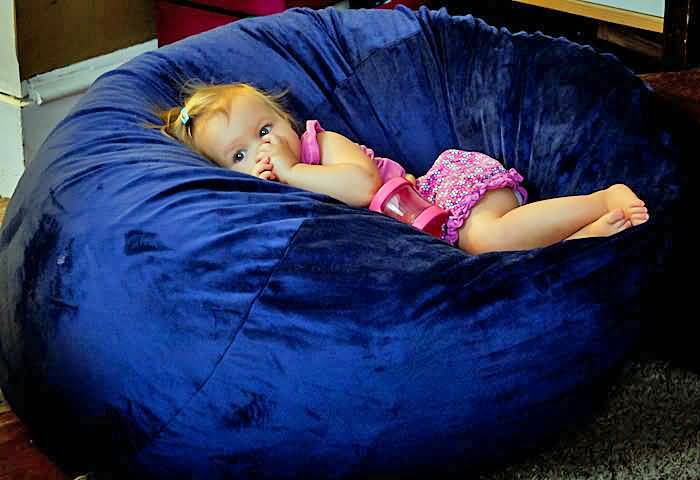 Why not turn it into a family day and snuggle up on bean bag chairs for the kids, bake cookies, and be together. Try this gluten-free, healthy, super easy peanut butter cookie recipe! I've got the fire going, the family is all cuddled and cozied up on their bean bag chairs watching a movie, and I'm going to back some super easy and HEALTHY, gluten-free cookies after I finish this post. I was given this recipe by my best friend, and it's so simple. Very few ingredients that you probably already have in your kitchn pantry and refridgerator - and no messy flour! Your kids can whip this recipe up quickly too! I fill mason jars up ($1 jars at the grocery store) and tie a bow on and give these as impromptu, surprise little goody gifts to friends and family all year long, but especially during cold Winter months. I also add peanut butter chips sometimes, but you can try carob, chocolate chips, m&ms, maybe oatmeal? Enjoy and have some family fun today on your bean bags eating freshly baked homemade easy-peasy peanut butter cookies! 2 Prepare baking sheets with parchment paper. 3 In a medium bowl mix the peanut butter and the sugar until smooth. 4 Add the eggs one at a time, then add the baking soda, salt and the vanilla essence. 5 Roll dough into walnut size balls, place on the baking sheet giving them room to spread, press down slightly with a wet fork. 6 Bake for 8 to ten minutes, remove from the oven and leave them on the baking sheet to cool for a few minutes, they will be very soft at this stage, then remove to a wire rack to cool completely. 7 Depending on your cookie size it should make 36 cookies.